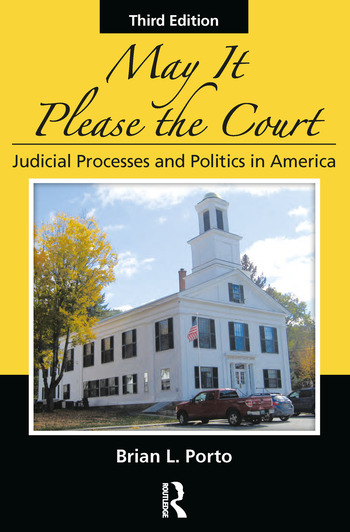 This practical, comprehensive, and engaging introduction to the American judicial system is designed primarily for undergraduate students in criminal justice, liberal arts, political science, and beginning law. It differs from other texts not only by delivering an insider’s view of the courts, but also by demonstrating how the judicial process operates at the intersection of law and politics. Unlike the many dull and inaccessible texts in this field, May It Please The Court conveys the human drama of civil and criminal litigation. With an updated epilogue, case studies, and discussion questions, this third edition is a robust resource for criminal justice students. Brian Porto is a professor at Vermont Law School, where he teaches courses in legal writing, sports law, and election law. He holds a J.D. from Indiana University-Bloomington and a Ph.D. from Miami University (Ohio). He has taught political science at Macalester College (MN) and at Norwich University (VT), and has worked as a lawyer in both state government and private practice. He is licensed to practice law in Vermont and Indiana. Dr. Porto is the author of four books, most recently The Supreme Court and the NCAA: The Case for Less Commercialism and More Due Process in College Sports (University of Michigan Press, 2012), and numerous articles on legal issues and institutions. He lives in Windsor, VT with his wife, Sherrie Greeley. When not teaching or writing, he enjoys hiking, kayaking, and cross-country skiing.